the half-mile pole to the wire, under exercise rider Joanna Trout. so I thought she didn’t need company to breeze with; she’d do enough on her own. the Gazelle, Close Hatches does not work longer distances. the lead or how fast they go. Xaar, who was a champion two-year-old, but more of a miler. horses, and there’s even a two-mile Group 1 winner in there, Chief Contender. to the track one day after posting a five-furlong move in 1:01.
with the fourth fastest of 42 works at the distance. Code West. The six-furlong gallop out time was 1:11 4/5. Code West advancing to the Derby, but enthused about Midnight Lucky. 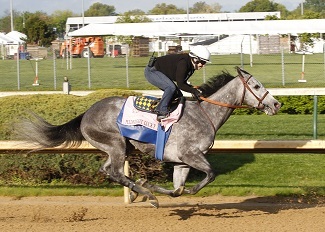 “She’s always worked well and we’ve always been high on her,” Baffert said. Baffert said the Oaks will be a real test for his Sunland Park Oaks winner.